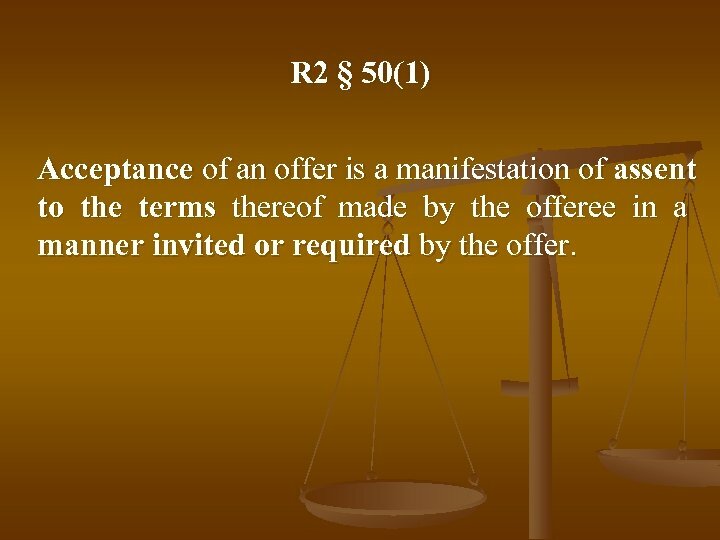 R 2 § 50(1) Acceptance of an offer is a manifestation of assent to the terms thereof made by the offeree in a manner invited or required by the offer. 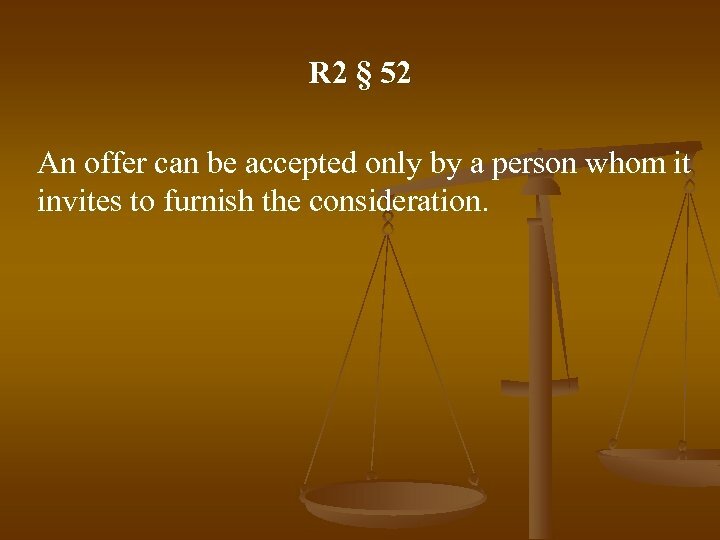 R 2 § 52 An offer can be accepted only by a person whom it invites to furnish the consideration. 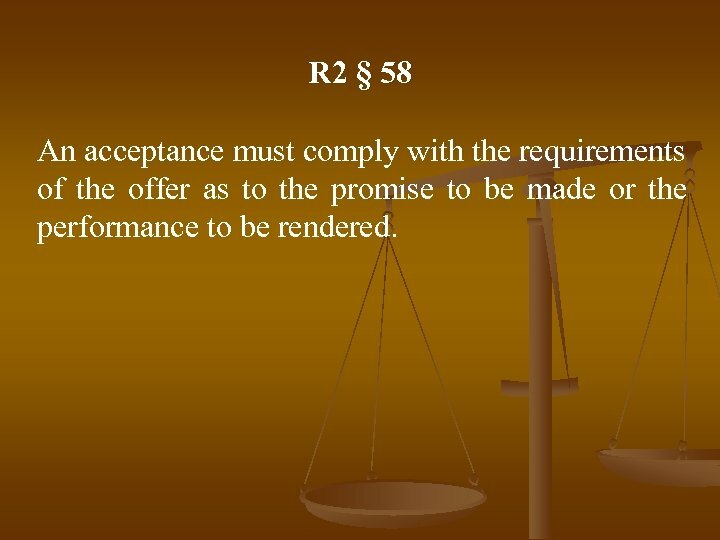 R 2 § 58 An acceptance must comply with the requirements of the offer as to the promise to be made or the performance to be rendered. 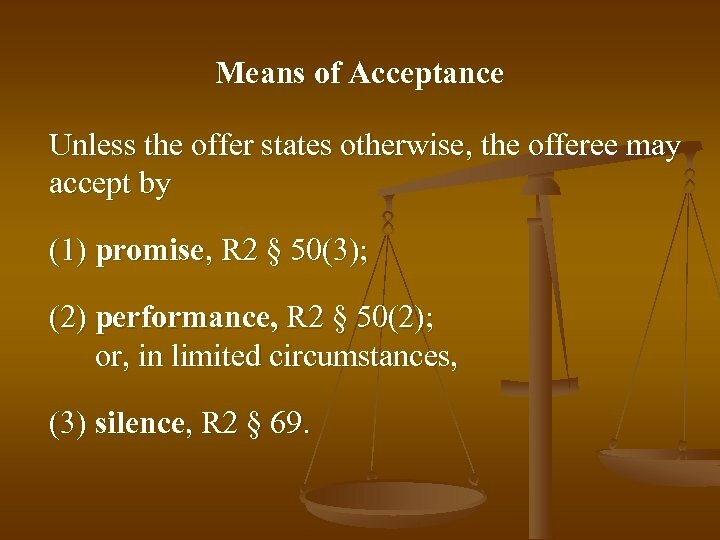 Means of Acceptance Unless the offer states otherwise, the offeree may accept by (1) promise, R 2 § 50(3); (2) performance, R 2 § 50(2); or, in limited circumstances, (3) silence, R 2 § 69. 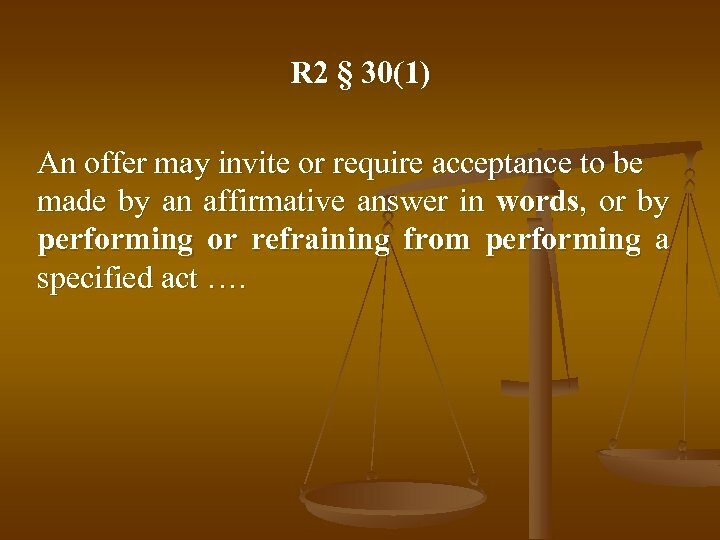 R 2 § 30(1) An offer may invite or require acceptance to be made by an affirmative answer in words, or by performing or refraining from performing a specified act …. 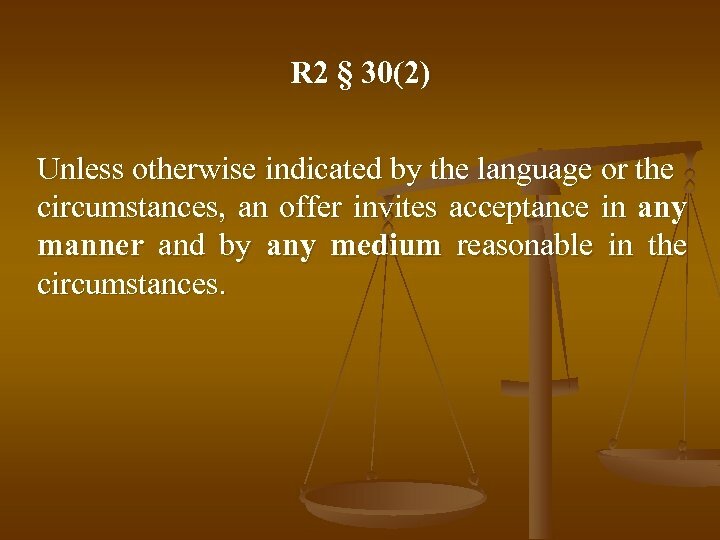 R 2 § 30(2) Unless otherwise indicated by the language or the circumstances, an offer invites acceptance in any manner and by any medium reasonable in the circumstances. 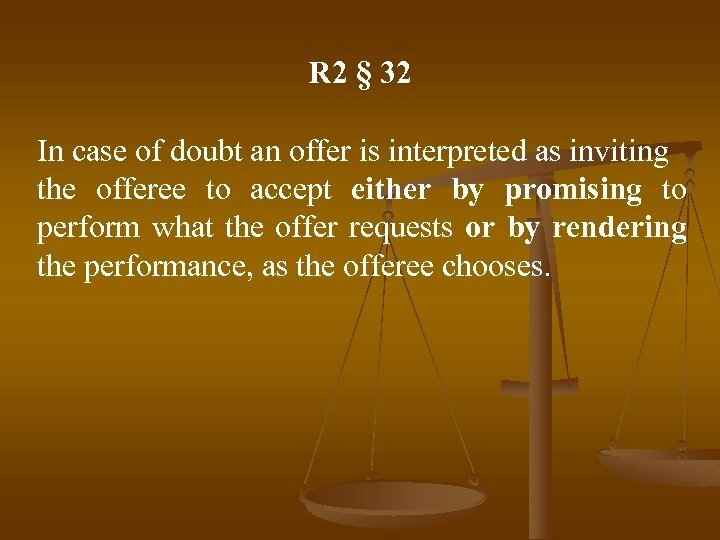 R 2 § 32 In case of doubt an offer is interpreted as inviting the offeree to accept either by promising to perform what the offer requests or by rendering the performance, as the offeree chooses. 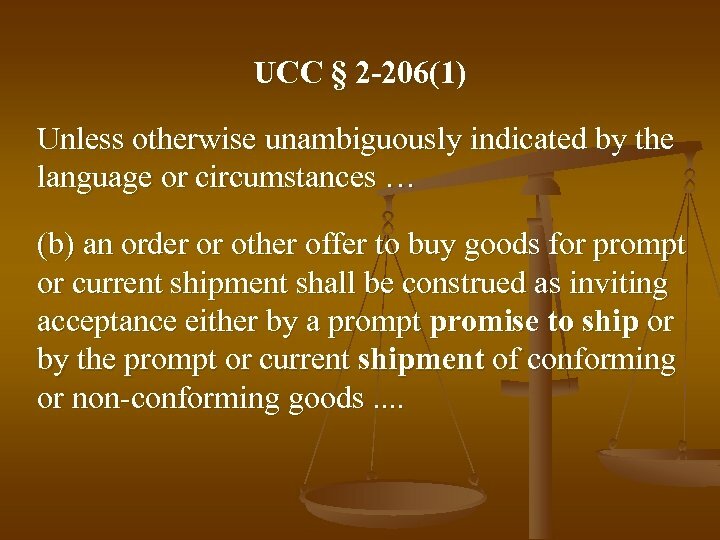 UCC § 2 -206(1) Unless otherwise unambiguously indicated by the language or circumstances … (b) an order or other offer to buy goods for prompt or current shipment shall be construed as inviting acceptance either by a prompt promise to ship or by the prompt or current shipment of conforming or non-conforming goods. .
CISG art. 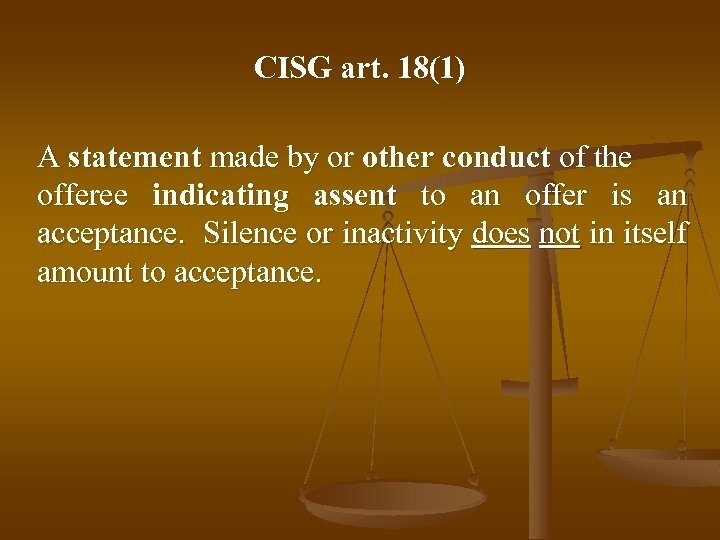 18(1) A statement made by or other conduct of the offeree indicating assent to an offer is an acceptance. Silence or inactivity does not in itself amount to acceptance. 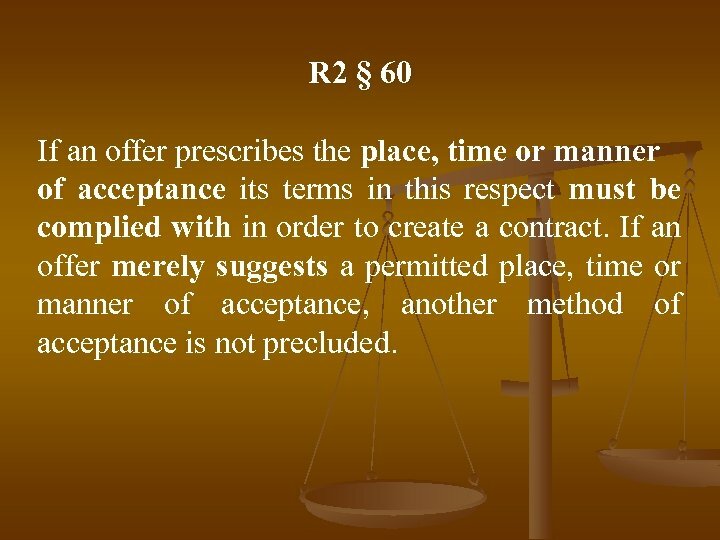 R 2 § 60 If an offer prescribes the place, time or manner of acceptance its terms in this respect must be complied with in order to create a contract. If an offer merely suggests a permitted place, time or manner of acceptance, another method of acceptance is not precluded. 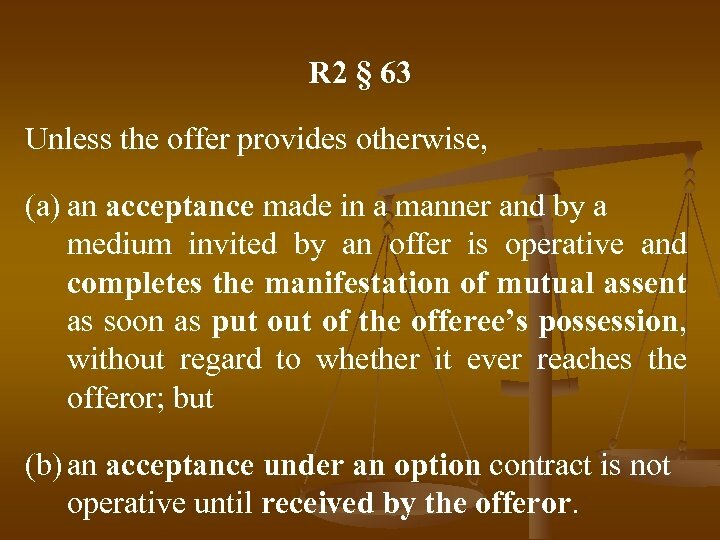 R 2 § 63 Unless the offer provides otherwise, (a) an acceptance made in a manner and by a medium invited by an offer is operative and completes the manifestation of mutual assent as soon as put of the offeree’s possession, without regard to whether it ever reaches the offeror; but (b) an acceptance under an option contract is not operative until received by the offeror. 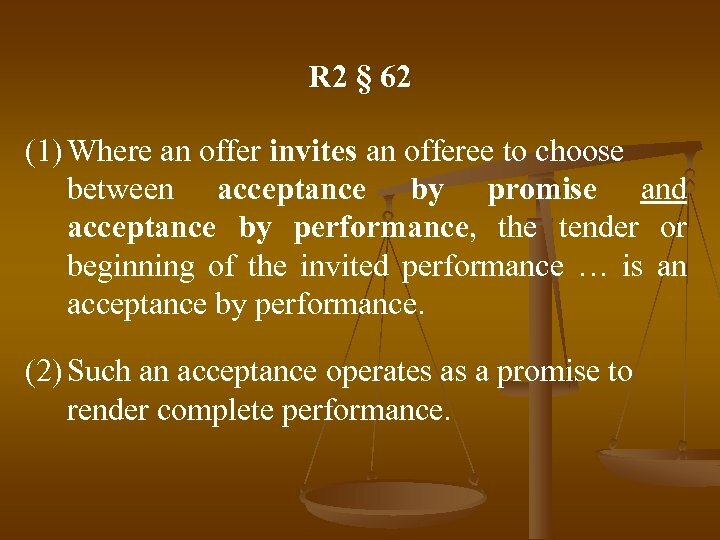 R 2 § 62 (1) Where an offer invites an offeree to choose between acceptance by promise and acceptance by performance, the tender or beginning of the invited performance … is an acceptance by performance. (2) Such an acceptance operates as a promise to render complete performance. 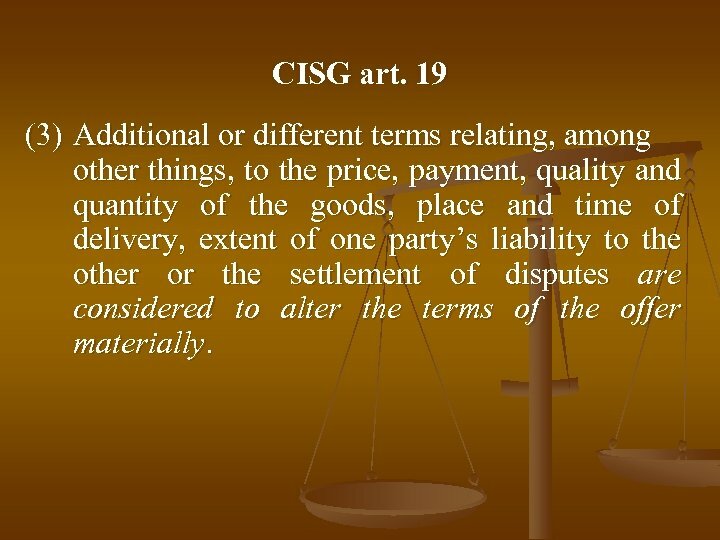 CISG art. 18(2) An acceptance of an offer becomes effective at the moment the indication of assent reaches the offeror. 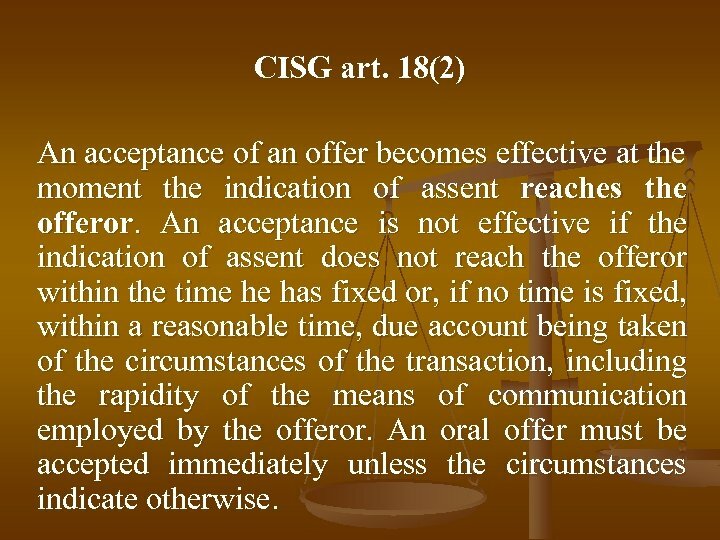 An acceptance is not effective if the indication of assent does not reach the offeror within the time he has fixed or, if no time is fixed, within a reasonable time, due account being taken of the circumstances of the transaction, including the rapidity of the means of communication employed by the offeror. An oral offer must be accepted immediately unless the circumstances indicate otherwise. CISG art. 18(3) [I]f, by virtue of the offer or as a result of practices which the parties have established between themselves or of usage, the offeree may indicate assent by performing an act, such as one relating to the dispatch of the goods or payment of the price, without notice to the offeror, the acceptance is effective at the moment the act is performed, provided that the act is performed within the period of time laid down in the preceding paragraph. 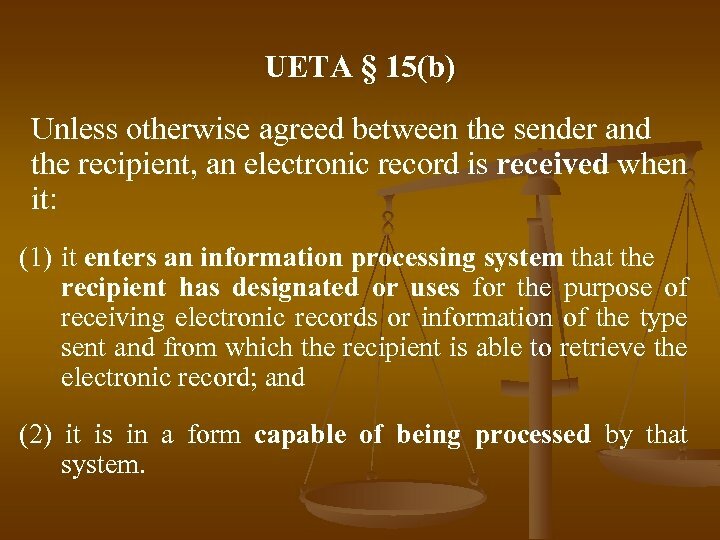 UETA § 15(a) Unless otherwise agreed between the sender and the recipient, an electronic record is sent when it: (1) is addressed properly or otherwise directed properly to an information processing system that the recipient has designated or uses for the purpose of receiving electronic records or information of the type sent and from which the recipient is able to retrieve the electronic record; (2) is in a form capable of being processed by that system; and (3) enters an information processing system outside the control of the sender or of a person that sent the electronic record on behalf of the sender or enters a region of the information processing system designated or used by the recipient which is under the control of the recipient. 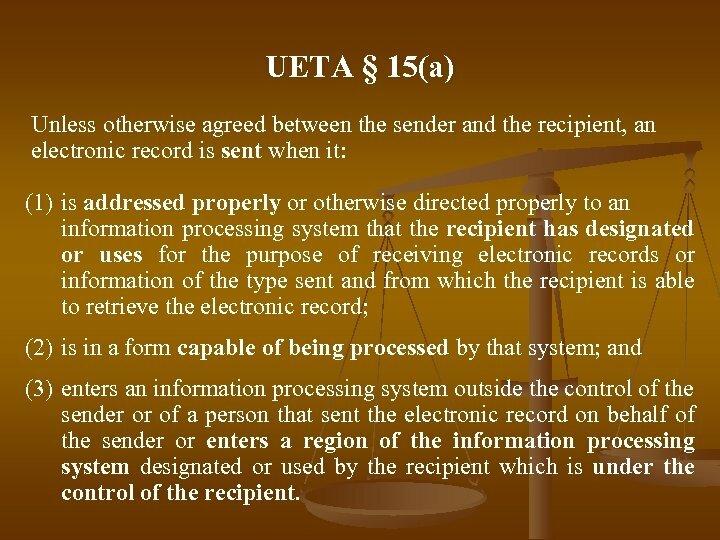 UETA § 15(b) Unless otherwise agreed between the sender and the recipient, an electronic record is received when it: (1) it enters an information processing system that the recipient has designated or uses for the purpose of receiving electronic records or information of the type sent and from which the recipient is able to retrieve the electronic record; and (2) it is in a form capable of being processed by that system. 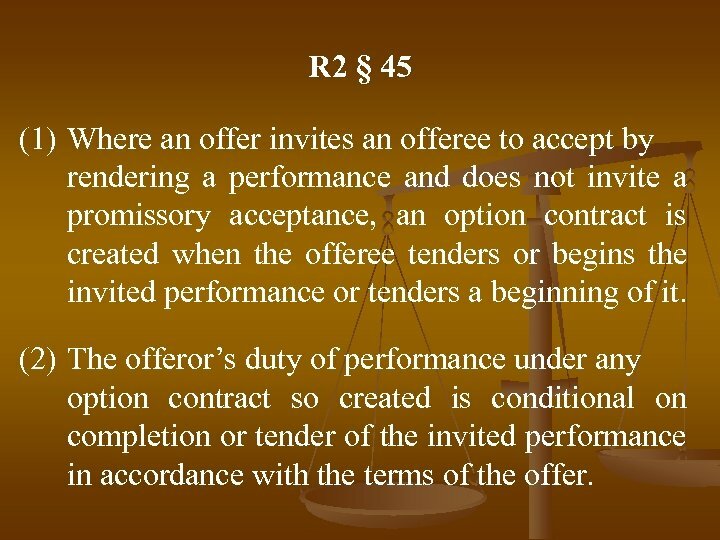 R 2 § 45 (1) Where an offer invites an offeree to accept by rendering a performance and does not invite a promissory acceptance, an option contract is created when the offeree tenders or begins the invited performance or tenders a beginning of it. 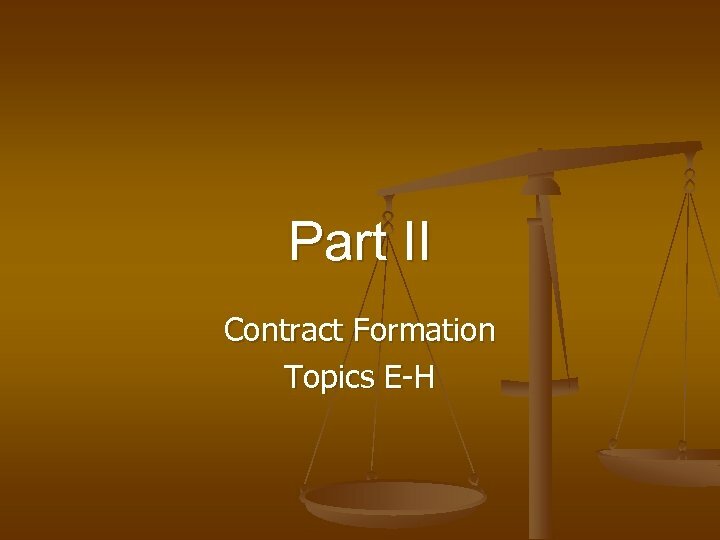 (2) The offeror’s duty of performance under any option contract so created is conditional on completion or tender of the invited performance in accordance with the terms of the offer. 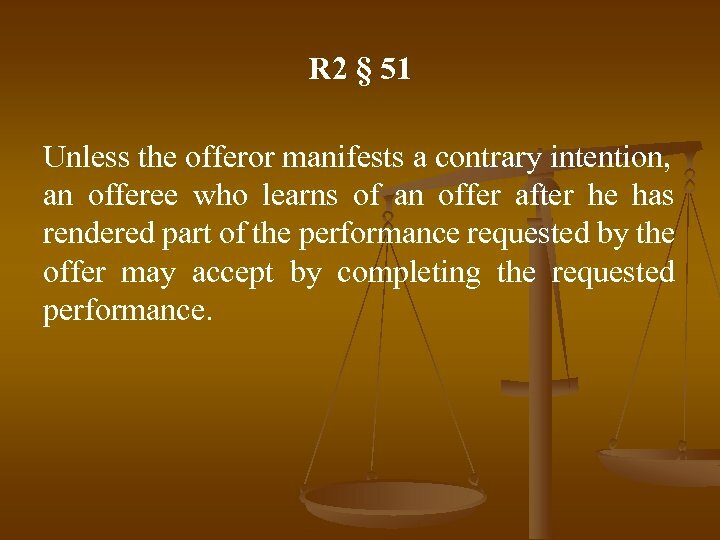 R 2 § 51 Unless the offeror manifests a contrary intention, an offeree who learns of an offer after he has rendered part of the performance requested by the offer may accept by completing the requested performance. 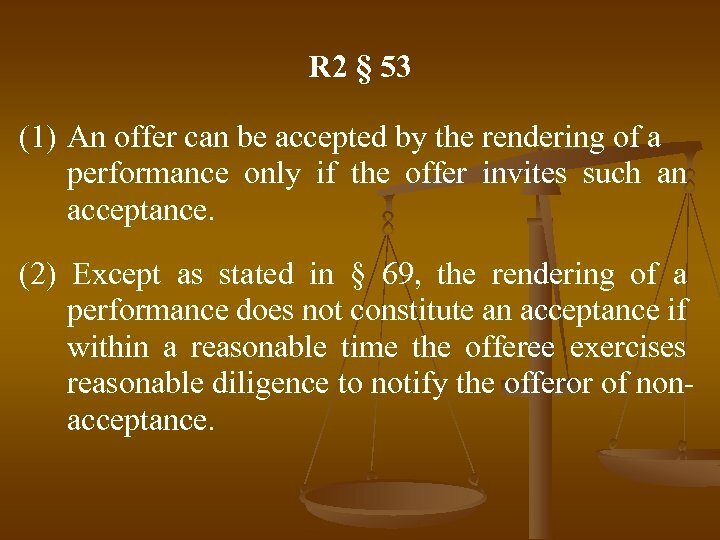 R 2 § 53 (1) An offer can be accepted by the rendering of a performance only if the offer invites such an acceptance. 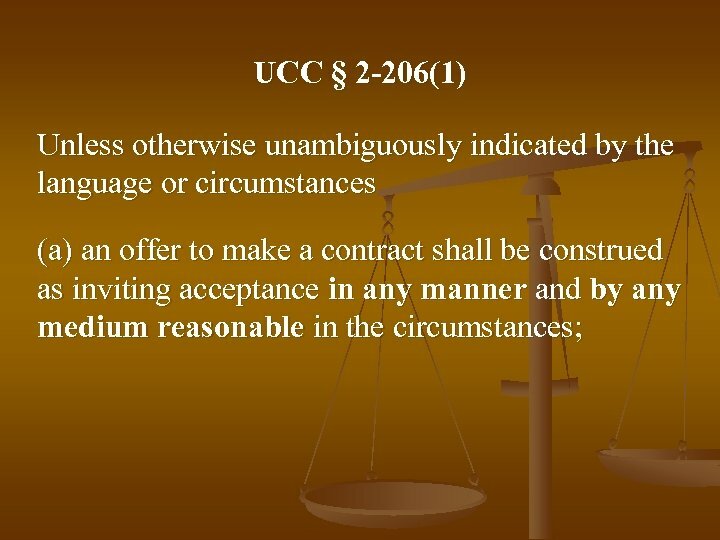 (2) Except as stated in § 69, the rendering of a performance does not constitute an acceptance if within a reasonable time the offeree exercises reasonable diligence to notify the offeror of nonacceptance. 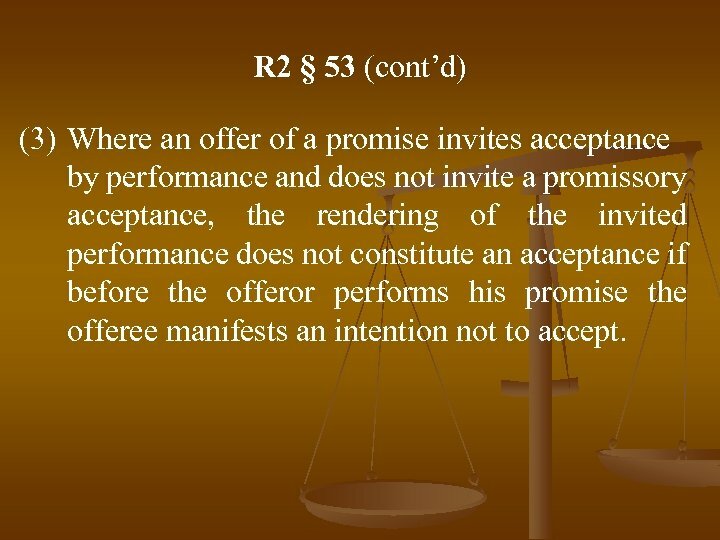 R 2 § 53 (cont’d) (3) Where an offer of a promise invites acceptance by performance and does not invite a promissory acceptance, the rendering of the invited performance does not constitute an acceptance if before the offeror performs his promise the offeree manifests an intention not to accept. 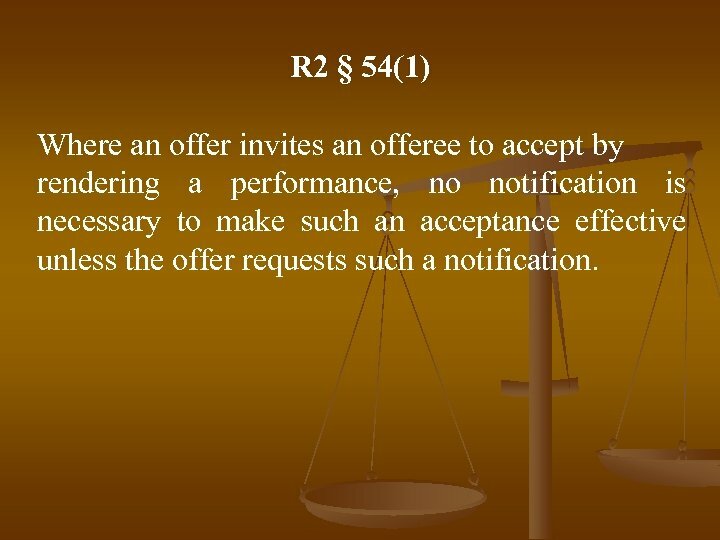 R 2 § 54(1) Where an offer invites an offeree to accept by rendering a performance, no notification is necessary to make such an acceptance effective unless the offer requests such a notification. 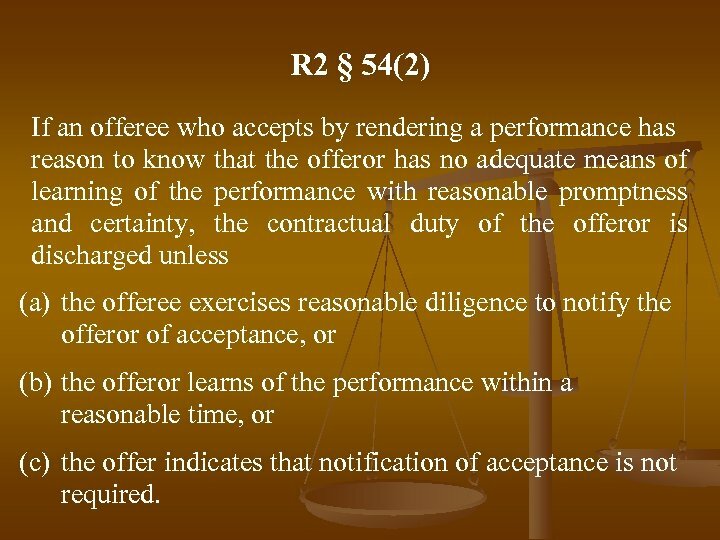 R 2 § 54(2) If an offeree who accepts by rendering a performance has reason to know that the offeror has no adequate means of learning of the performance with reasonable promptness and certainty, the contractual duty of the offeror is discharged unless (a) the offeree exercises reasonable diligence to notify the offeror of acceptance, or (b) the offeror learns of the performance within a reasonable time, or (c) the offer indicates that notification of acceptance is not required. 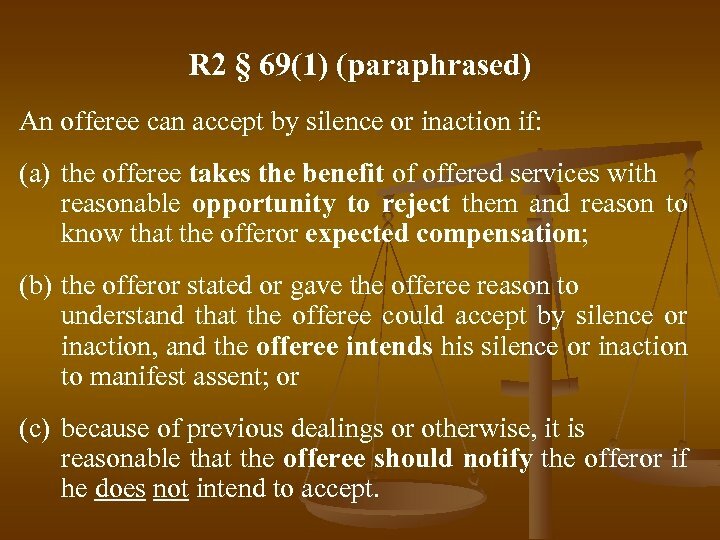 R 2 § 69(1) (paraphrased) An offeree can accept by silence or inaction if: (a) the offeree takes the benefit of offered services with reasonable opportunity to reject them and reason to know that the offeror expected compensation; (b) the offeror stated or gave the offeree reason to understand that the offeree could accept by silence or inaction, and the offeree intends his silence or inaction to manifest assent; or (c) because of previous dealings or otherwise, it is reasonable that the offeree should notify the offeror if he does not intend to accept. 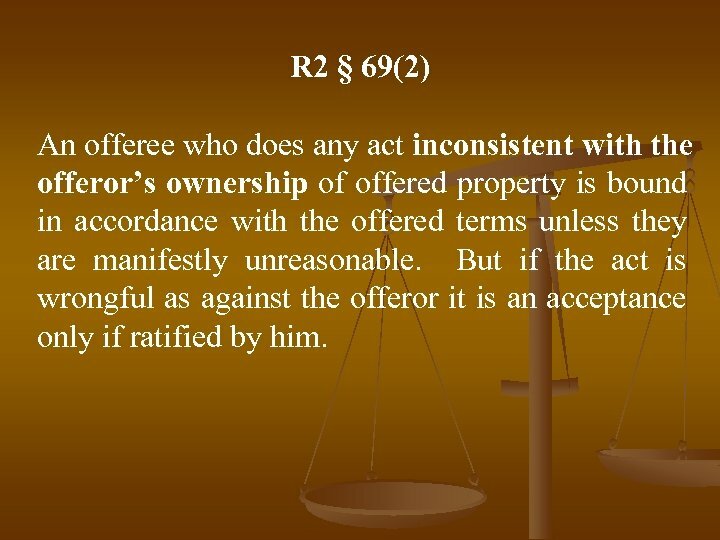 R 2 § 69(2) An offeree who does any act inconsistent with the offeror’s ownership of offered property is bound in accordance with the offered terms unless they are manifestly unreasonable. But if the act is wrongful as against the offeror it is an acceptance only if ratified by him. B is a professional piano instructor. A brings her daughter C to B’s studio for an introductory session. 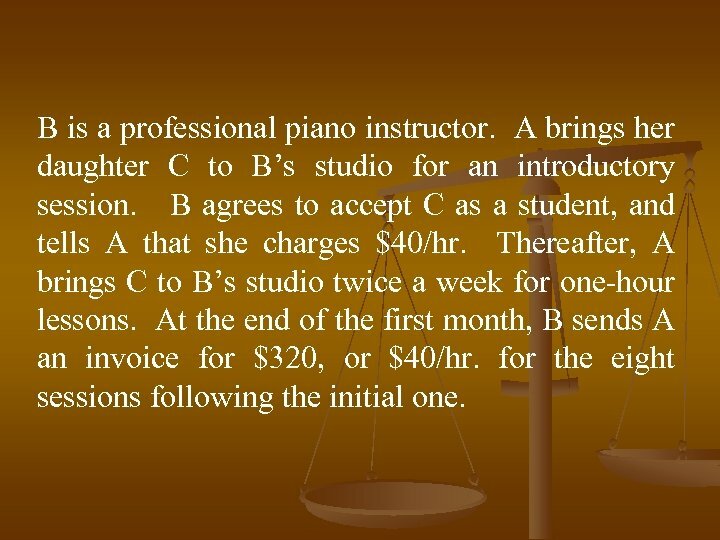 B agrees to accept C as a student, and tells A that she charges $40/hr. Thereafter, A brings C to B’s studio twice a week for one-hour lessons. At the end of the first month, B sends A an invoice for $320, or $40/hr. for the eight sessions following the initial one. 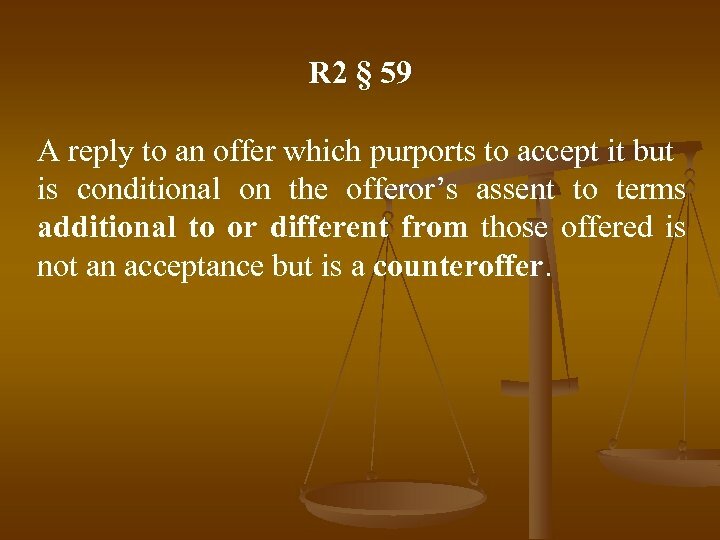 R 2 § 59 A reply to an offer which purports to accept it but is conditional on the offeror’s assent to terms additional to or different from those offered is not an acceptance but is a counteroffer. 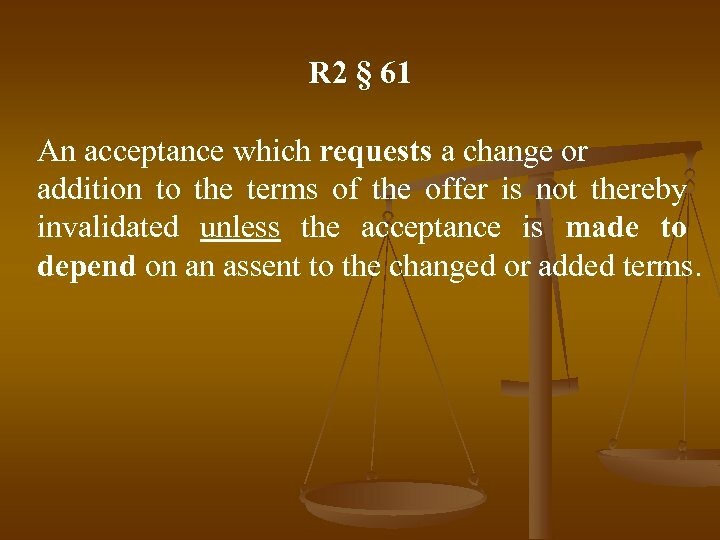 R 2 § 61 An acceptance which requests a change or addition to the terms of the offer is not thereby invalidated unless the acceptance is made to depend on an assent to the changed or added terms. 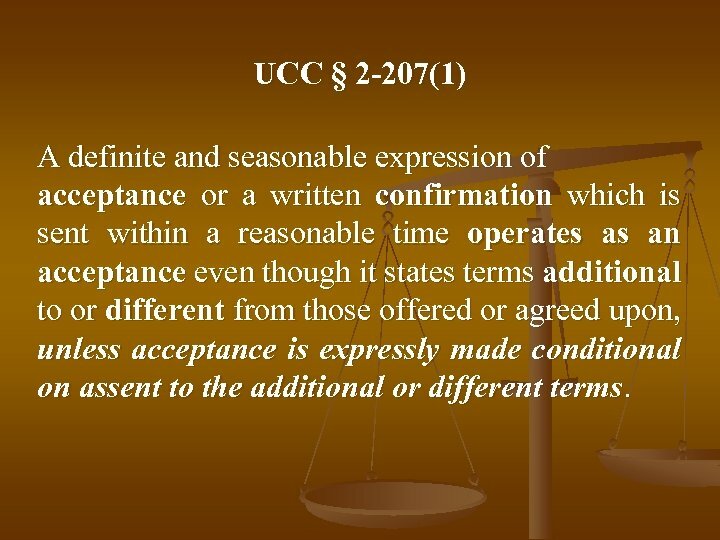 UCC § 2 -207(1) A definite and seasonable expression of acceptance or a written confirmation which is sent within a reasonable time operates as an acceptance even though it states terms additional to or different from those offered or agreed upon, unless acceptance is expressly made conditional on assent to the additional or different terms. 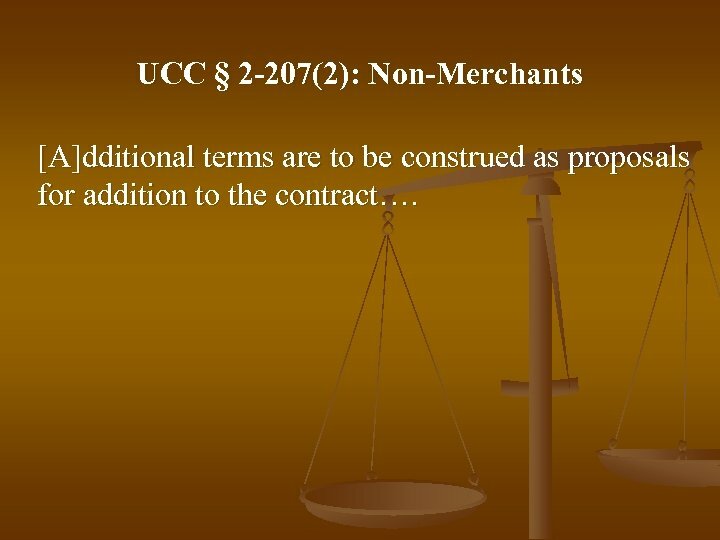 UCC § 2 -207(2): Non-Merchants [A]dditional terms are to be construed as proposals for addition to the contract…. 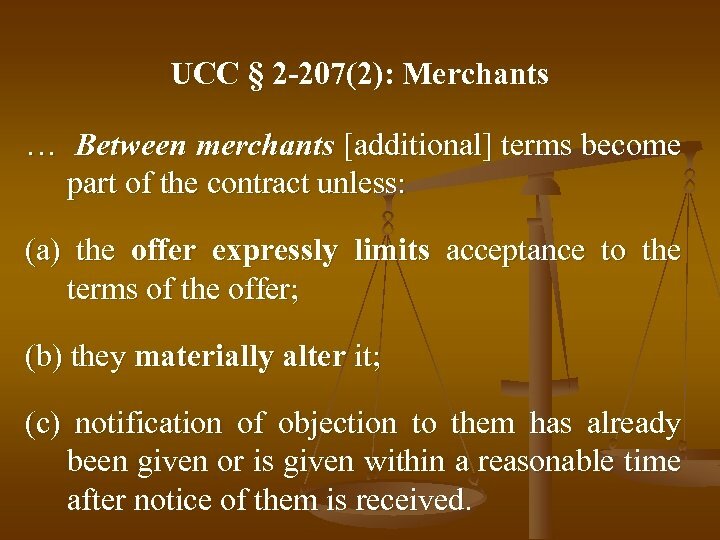 UCC § 2 -207(2): Merchants … Between merchants [additional] terms become part of the contract unless: (a) the offer expressly limits acceptance to the terms of the offer; (b) they materially alter it; (c) notification of objection to them has already been given or is given within a reasonable time after notice of them is received. CISG art. 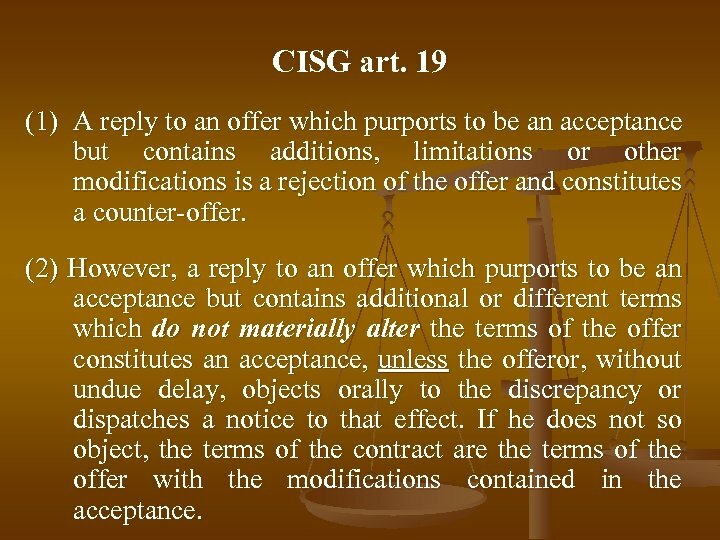 19 (1) A reply to an offer which purports to be an acceptance but contains additions, limitations or other modifications is a rejection of the offer and constitutes a counter-offer. 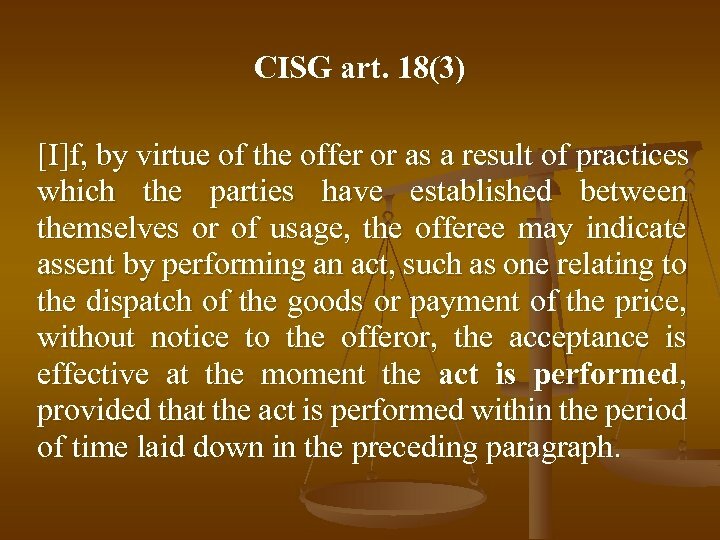 (2) However, a reply to an offer which purports to be an acceptance but contains additional or different terms which do not materially alter the terms of the offer constitutes an acceptance, unless the offeror, without undue delay, objects orally to the discrepancy or dispatches a notice to that effect. 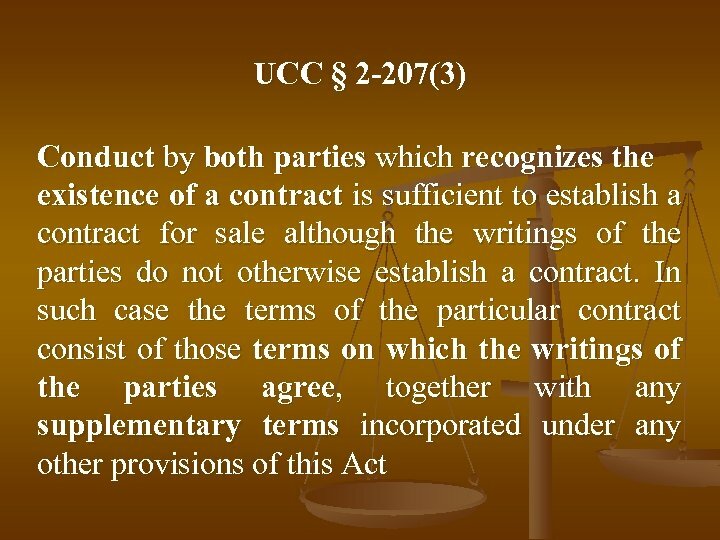 If he does not so object, the terms of the contract are the terms of the offer with the modifications contained in the acceptance. CISG art. 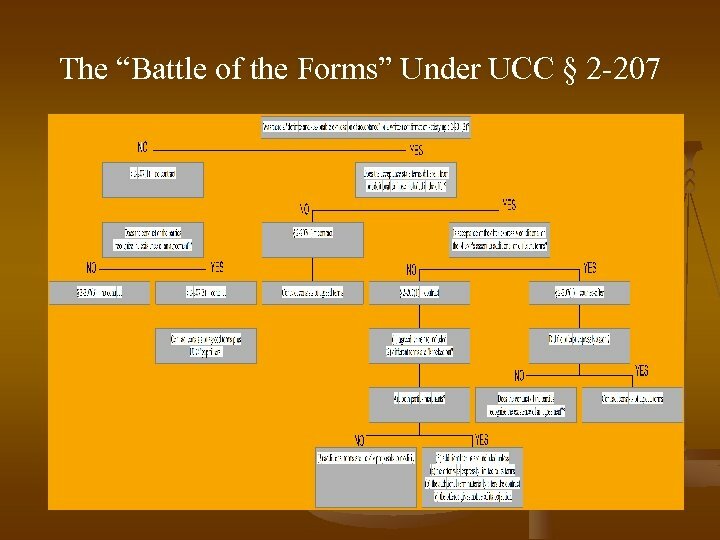 19 (3) Additional or different terms relating, among other things, to the price, payment, quality and quantity of the goods, place and time of delivery, extent of one party’s liability to the other or the settlement of disputes are considered to alter the terms of the offer materially. 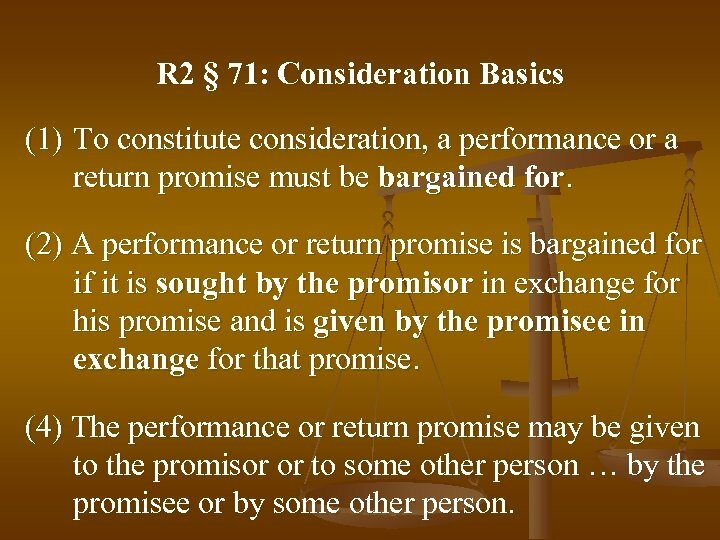 R 2 § 71: Consideration Basics (1) To constitute consideration, a performance or a return promise must be bargained for. (2) A performance or return promise is bargained for if it is sought by the promisor in exchange for his promise and is given by the promisee in exchange for that promise. (4) The performance or return promise may be given to the promisor or to some other person … by the promisee or by some other person. 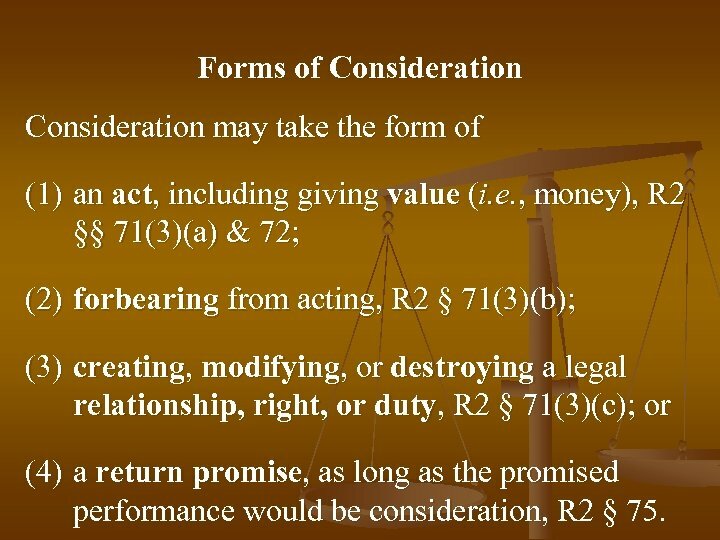 Forms of Consideration may take the form of (1) an act, including giving value (i. e. , money), R 2 §§ 71(3)(a) & 72; (2) forbearing from acting, R 2 § 71(3)(b); (3) creating, modifying, or destroying a legal relationship, right, or duty, R 2 § 71(3)(c); or (4) a return promise, as long as the promised performance would be consideration, R 2 § 75. 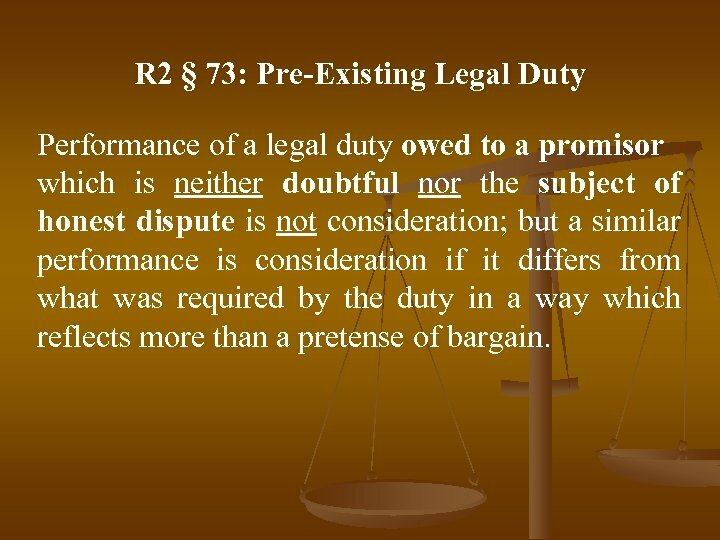 R 2 § 73: Pre-Existing Legal Duty Performance of a legal duty owed to a promisor which is neither doubtful nor the subject of honest dispute is not consideration; but a similar performance is consideration if it differs from what was required by the duty in a way which reflects more than a pretense of bargain. 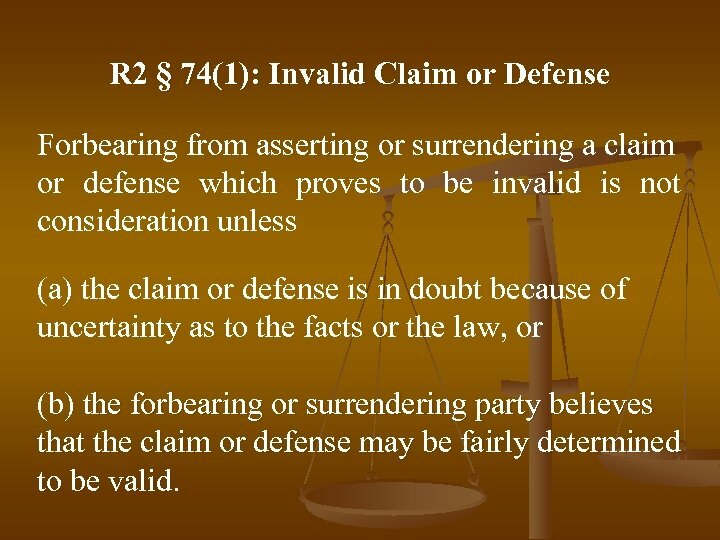 R 2 § 74(1): Invalid Claim or Defense Forbearing from asserting or surrendering a claim or defense which proves to be invalid is not consideration unless (a) the claim or defense is in doubt because of uncertainty as to the facts or the law, or (b) the forbearing or surrendering party believes that the claim or defense may be fairly determined to be valid. 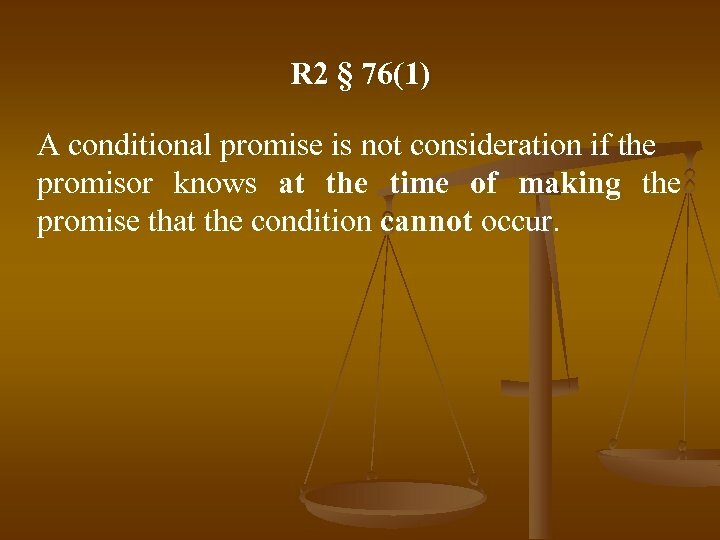 R 2 § 76(1) A conditional promise is not consideration if the promisor knows at the time of making the promise that the condition cannot occur. 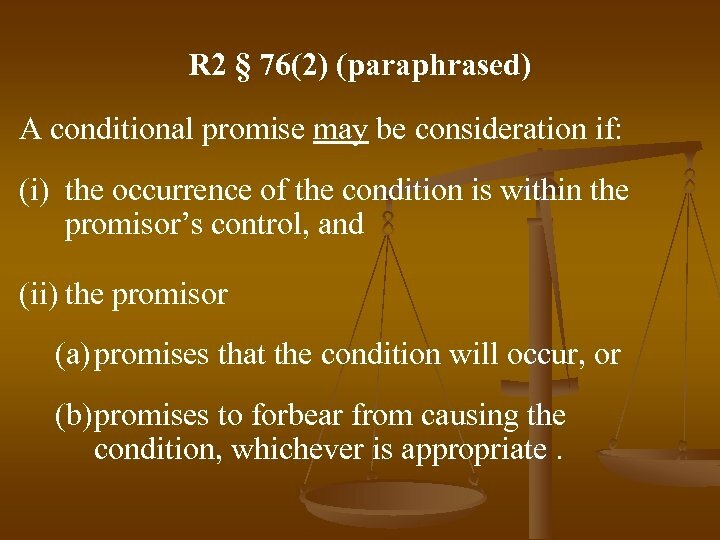 R 2 § 76(2) (paraphrased) A conditional promise may be consideration if: (i) the occurrence of the condition is within the promisor’s control, and (ii) the promisor (a) promises that the condition will occur, or (b)promises to forbear from causing the condition, whichever is appropriate. CLAUSE GAME Check && Gain ? ?